Tuna is massively important for many Pacific island nations. Kiribati, a country whose land mass is only 0.02% of its total area (the rest is sea), gets about 30% of its GDP from tuna fishing. Not that the I-Kiribati (people from Kiribati, that is) catch much of that themselves: most of it is caught by fishers from other countries, like Japan, Spain, and the United States, who pay Kiribati for the right to fish in its national waters. 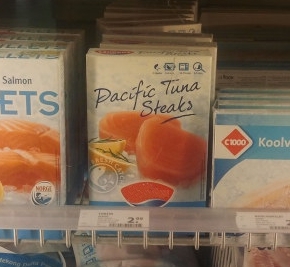 Actually, to just call it “tuna” is misleading, because there are several species of it. If you have ever had a tuna sandwich you will probably have eaten skipjack tuna. It is the cheapest, least tasty, but also the most abundant tuna species: the IUCN is not particularly concerned about it, and the FAO assesses we can catch some more of it without depleting its stock (pdf). The species in the pack in the picture, yellowfin, is doing less well: the IUCN labels the species “near threatened”, and the FAO argues against catch increases of this species. Other species are doing worse or much worse than that: bigeye tuna, for instance, is labelled “vulnerable” 1. So we should all eat skipjack instead instead of yellowfin and bigeye, right? If only life were that simple. Yellowfin and bigeye are often caught as so-called bycatch of skipjack tuna. Many fishers use Fish Aggregating Devices (FADs) that attract all kinds of fish, starting from small fry all the way up the food chain to several species of tuna. When this includes a school of tuna, fishers draw a purse seine net around the FAD and haul in their bounty. Fishing this way, you are likely to catch a lot of skipjack, yellowfin and bigeye at once, where the yellowfin and bigeye you catch is probably still young and difficult to separate from the adult skipjack. And hence yellowfin and bigeye often end up in a tuna sandwich at a young age where they could have had a glorious career as sushi or tuna steak. Therefore, the FAO recommends not to increase skipjack catches: not because it is concerned about skipjack stocks, but because catching more skipjack will likely have a negative impact on stocks of yellowfin and bigeye. So perhaps to preserve yellowfin and bigeye stocks, the last thing one should do is buy skipjack tuna. Governments have used all kinds of different policy instruments to manage fisheries, such as days-at-sea restrictions, or individual transferable quota, or a variety of gear regulations. Such instruments, however, are not everywhere as easy to implement, and governments are in a difficult situation themselves. It is often difficult to observe how much fishers have caught. Moreover, if Kiribati limits its tuna catch in order to preserve tuna stocks for the future, fishers gladly move on to the next Pacific Island Nation to fish there. Perhaps retailers, NGOs, and consumers should step in? We could reward fishers who fish more selectively with some certification scheme: guilt-ridden consumers may be willing to pay some extra for guilt-free tuna. But what if that simply increases demand for fish, and thereby fishing pressure? Last week I was in Bogor, Indonesia, to discuss this problem with colleagues from Wageningen University and other institutes. 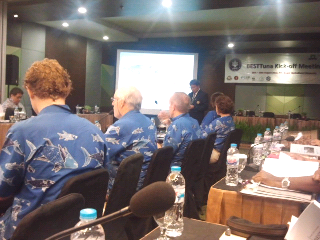 We were at the kick-off of BESTTuna, a project of Wageningen University together with many other organisations, including Bogor Agricultural University, University of the South Pacific, University of the Philippines, University of California, Santa Barbara, WWF, and Anova Seafood. The objective of BESTTuna is to look deeper into the management problem with skipjack, yellowfin, and bigeye tuna, considering the different countries involved, the different fishing techniques, the companies involved, NGOs, fishers, and so on. Should Indonesia introduce individual tradable quota? Will MSC certification give fishers an incentive to fish sustainably or will it only enhance fishing pressure as green consumers can start eating tuna with a seemingly clear conscience? How can we make sure that Pacific Island Nations cooperate to manage their tuna stocks sustainably? It’s a complex, but therefore also fascinating problem – and it’s one of those problems you’re reminded of every time you enter the supermarket.